SitePro® introduces its newest Skid Steer Hydraulic Cement Mixer, Model SS-590. Direct hydraulic drive of the gearbox eliminates chain and sprocket maintenance resulting in more up-time on the jobsite. Large 11-cubic ft. drum allows the operator to mix, transport and place 5-cubic ft. of concrete. 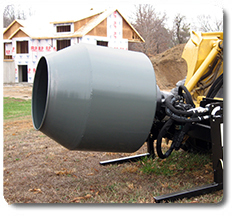 This hydraulic cement mixer’s efficient design offers the contractor a cost savings over chain driven models. View our literature. Five (5) cu./ft. capacity (1 bag mix). Compact, trouble free, long life design with few moving parts.